The Memorable Words, both the dead serious and the lighthearted, are carefully presented – the fascinating and frivolous, the tragic and momentous, the eloquent and bumbling; the touching and endearing – from Ike to Obama, from Lucy to Lady Gaga. 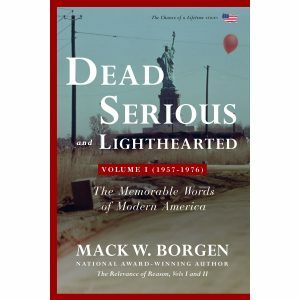 Dead Serious and Lighthearted is written without agenda, but it carefully identifies who said what and when and where – exactly. Its words can help us know our country; better remember who we are and from whence we came. This first volume presents the words from 1957 until 1976 – from American Bandstand to The Godfather, from Lucy to Charlie’s Angels and Rocky’s call of “Yo Adrian!”; from the end of the Fifties through the wildness of the Sixties, from the ascendancy of the Civil Rights, feminist, and environmental movements through the tragedy of Vietnam and the disgrace of Watergate. This entry was posted on Wednesday, February 21st, 2018 at 11:51 am	and is filed under . You can follow any responses to this entry through the RSS 2.0 feed. Both comments and pings are currently closed.